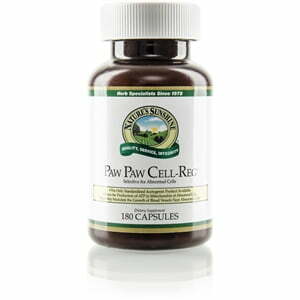 Nature’s Sunshine Paw Paw Cell-RegTM promotes health on the cellular level by targeting certain cells. Paw paw extract contains acetogenins, complex chemicals that play a role in the production of ATP, the key source of cellular energy. The acetogenins included in the formula help regulate the viability and growth of those cells and the blood vessels that provide them nourishment. The acetogenins in paw paw extract have been shown in a clinical study to provide cellular support when the body is under cellular stress. 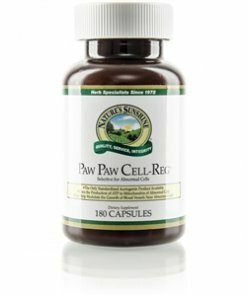 Paw Paw Cell-Reg should not be used in conjunction with Co-Q10, Thyroid Support, or 7-KetoTM, all formulas that may decrease the products effectiveness. Only sufferers of cellular abnormalities should regularly consume this product. Pregnant, soon-to-be pregnant, or breastfeeding women should avoid Paw Paw Cell-Reg. Instructions: Take 2 capsules with food three times daily. Do not exceed recommended serving size. If recommended serving size is exceeded nausea may occur. Cellulose (plant fiber), magnesium stearate, silicon dioxide (powdered silica), gelatin and water.